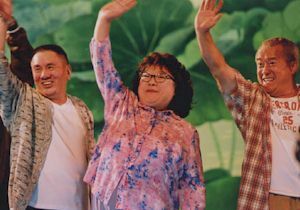 (left) James Wong, Lydia Shum and Eric Tsang, and (right), Shawn Yue and Coco Chiang. The Skinny: Lunar New Year comedy based on a hit Guangzhou TV show...and it shows. If you're a fan of that show then you might like this movie. Otherwise, you should probably skip this slapdash production which recalls the starstudded New Year comedies of the late eighties and early nineties. Except, this movie has very few stars. Raymond Wong's Mandarin Films jumps back into the Lunar New Year fray with In-Laws, Out-Laws, an ensemble comedy which recalls the Lunar New Year flicks of years past. Like some of the other flicks Wong had his name on (Eighth Happiness, All's Well Ends Well), In-Laws, Out-Laws centers on family hijinks, and is generally steeped in cultural mores which may lose some Western audiences. However, unlike those films, In-Laws, Out-Laws has extra source material: it was based on a hit Guangzhou television show, which means an extra layer of cultural specificity which might make the film even more inaccessible to Western audiences. Another major difference: most of the cast members of this film are generally not "names" in the Hong Kong entertainment circle. Also, the movie is really not very good, though that's not really a function of the above-named differences. It's just the way things are. Lydia Shum stars as the matriarch of the Hong family, a patchwork family consisting of three sons, one of which has a wife and fat young kid. When the tubby grandson discovers a hidden cavern beneath their residence, the family discovers that they're due to become millionaires. The cavern supposedly containes ancient Chinese relics, so they'll be able to sell off the artifacts and retire fat, wealthy and without a care. However, her long-delinquent husband (Eric Tsang) makes a comeback, bringing youngest son Joe (Shawn Yue) with him. Minor sparks are created by the return of the money-grubbing dad, but Mom decides to handle the divvying of the inheritance in her own inimitable, screechy way. She decides to split the money four ways among her four sons, with only married couples getting the money. That's where the big problems occur. The one married couple is looking to divorce, a fact they want kept secret from Mom because no marriage equals no inheritance. The eldest son is smitten with his dentist's assistant, and wants her to marry him, but she's a Mainland immigrant and her atrocious handle on Cantonese leads to all sorts of wacky wordplay completely ununderstandable by those who aren't Cantonese wordplay experts. Furthermore, the third son is in love with a car show model who's also a Mainland immigrant. In an attempt to bamboozle Mom, they copy the plot of her favorite Korean drama and pretend that the girl is a tragic mute who's also unrealistically sweet and kind. And finally, Joe falls for a half-Korean kung-fu artist (smoking hot model Coco Chiang Yi), but her dad (James Wong) decides to have a duel with Joe's dad to settle...something. Or maybe not. In any case, some sort of competition is required, which evolves from a kung-fu battle into a televised game show where James Wong and Eric Tsang try to outfox each other as ancient scholars trying to stay awake before a big exam. Surely, their plight is one shared by anyone who paid to see this film. In-Laws, Out-Laws was directed by Clifton Ko Chi-Sum, a man whose filmography has been alternately literate and culturally fascinating (The Umbrella Story, The Mad Phoenix), and strangely lazy and even cheap (Ninth Happiness, Love Paradox). In-Laws, Out-Laws errs closer towards lazy and cheap, and basing a film on a Guangzhou television show is nothing like mining the plays of Raymond To Kwok-Wai (a frequent inspiration of Clifton Ko's films). Furthermore, the antics on display are tired and not worth a second glance. Yes, there appear to be initial conflicts, but everyone reveals themselves to have a heart of gold and an understanding, tolerant mind, just like every other family-based Lunar New Year comedy in existence. If you saw All's Well Ends Well (also directed by Clifton Ko), you'll know that whatever conflicts that exist will be eclipsed by unearned changes of heart that are passed off as warm and fuzzy epiphanies. It was unconvincing then, and it's unconvincing now. However, what made stuff like All's Well Ends Well tolerable and even winning was the fact that you had big name stars acting like complete loonsand seemingly having a ball while doing it. All's Well Ends Well had Leslie Cheung, Stephen Chow, Maggie Cheung, Teresa Mo, and Sandra Ng, among others. In-Laws, Out-Laws has Eric Tsang, Lydia Shum, Shawn Yue, Coco Chiang, Cyrus Wong (Baldy Jr. from the Aces Go Places flicks! ), and a bunch of unknown actors to compensate. The result: not much superstar hijinks worth checking out. True, the hijinks themselves are not necessarily worse than anything seen in other films of its ilk, but when the most charismatic actor onscreen is Shawn Yue, the average Western HK film fan is hard-pressed to care.